Back in the Spring of 2010 a group of ramblers from Plymouth were walking by the King Wall on the western flank of Great Nodden and decided to stop for a coffee break. Whilst contemplating their surroundings one of the group spotted the remains of a stone cross set into the corn ditch wall. Corn ditches consist of an enclosure wall with a ditch on the outer side, their purpose was to allow deer to get out of the enclosure but not in. The bottom part of the cross appeared to have been broken off but there was a Greek style cross cut in relief on one of the sides. Whilst in-situ the cross measured about 0.44 x 0.29 metres and it is estimated that when entire it would have stood at around 2 metres high. The cross find was then reported to the Dartmoor National Park Authority who after inspection removed it to their works yard in order to have a new base made, this task was completed and the cross with its new based was moved to the High Dartmoor Visitor Centre at Princetown. The purpose of this temporary home was to be part of the National Park’s 60th anniversary, the cross was unveiled by Prince Charles. In 2011 the cross along with its base was returned to the actual find spot and erected to once again become a wayside cross. As the cross was found in-situ it would be useful to try and find out the date that the corn ditch was constructed as they may well give a date as to its demise? Although lagging behind times it was this year (2012) that I managed to go in search of the King Way Cross and as can be seen below did not pick the most favourable of days to do it. For some reason I had got it into my head that the cross had arms and stood fairly tall, therefore this was what I was looking for amidst the dense Dartmoor mist. A small boundstone-like shape eventually appeared from the gloom but this clearly was not the cross I was searching for. Luckily my walking partner, Rhys Eynon was with me who managed to spot the relief cross at the stone’s base. I will admit, if he had not found it I would have carried on down the King Wall in search of this elusive cross thus necessitating a return trip and much swearing. But why should there have been a wayside cross at this location? The common theory is that it would have stood beside an old coaching route which linked Tavistock to Exeter along which the King’s (probably Charles I, 1625 -1649) mail was carried. There are also suggestions that this route is of an greater age and may date back to Saxon times when it would have linked Lydford to Okehampton and then Exeter. Indeed, Benjamin Donn’s map of 1765 shows such a route going from Lydford Castle onto Okehampton along the route of the King Way. In 2008 the head of another cross was found about a half mile away on Little Links Tor (OD grid ref. SX54594 87066), this measured 0.49m by 0.47m, (Dartmoor Magazine, Summer 2008, p5). Could this cross also once have stood somewhere along the King Way? Another King Way cross related puzzle that I came across was that despite a thorough search in the area for the crosses’ original base none was found. 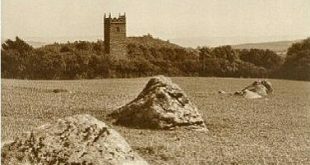 But in 1896, the noted Dartmoor author Sabine Bearing-Gould stated the following when describing Doe Tor Farm; ‘just beyond the door or entrance to the tiny court before the farm lies an octagonal mass of granite, with a socket sunk in the midst, the base of the many rude crosses that anciently stood on the moors...”, (Baring Gould, 1896, pp. 123 – 4). Doe Tor farm lies just over 1 mile south of where the King Way Cross was discovered, could this be this missing base? A site appraisal of the farm carried out by Wessex Archaeology in 2007 thinks not, they consider that; ‘this may be the writer’s licence for a ‘edge-runner’ stone, probably intended as an apple crusher‘, ((Wessex Archaeology, 2007, p.2). However, this appraisal was carried out previous to the discovery of both of the above crosses and I wonder if this might change the thinking? Finally, apart from the obvious religious connotations of a wayside cross, what other purpose would they have served? I think that after our visit to the King Way on a fairly typical misty Dartmoor Day the photograph below shows exactly what. It certainly would have been reassuring to see a cross looming out of the mist to act as a guide and confirmation that any traveller had not strayed off course, especially if they were not conversant with the landscape. Baring Gould, S. 1896 Dartmoor Idylls, London: Methuen & Co.
Dartmoor Magazine, 2008, New Cross Find – Vol. 91, Okehampton: Edgemoor Publishing.